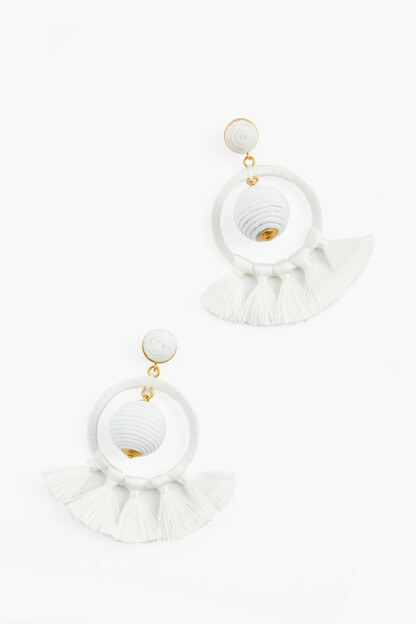 These earrings feature a cutout disc, tassels, and dangling globes all hand wrapped in cotton thread. 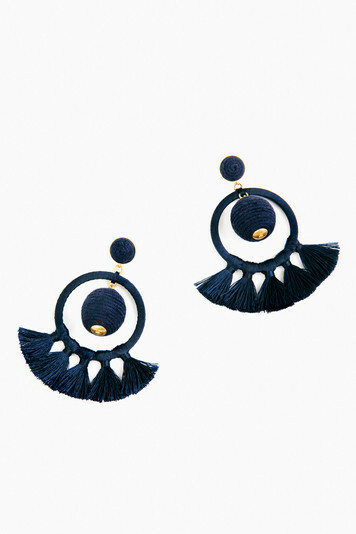 Pair with anything from dresses to denim for an elevated, bohemian look.The Navy Dreamcatcher Earrings are a year-round staple, and were designed with finding the fun in mind! How fun are these earrings! I typically only wear studs and am sensitive to heavier hoops and drop earrings, but these do not feel too heavy. The size is large without being overwhelming and the navy color is rich and beautiful. Will wear these all year round! I absolutely love these earrings! Have been wearing them out every big night of the summer, and they never fail to attract a compliment. My sister has in two other colors and we plan to continue building our collection :) You won’t be disappointed. For how many times I've already worn these earrings since receiving them a few weeks ago, they are absolutely a steal for their price!! Seamlessly transition from day to night, light enough to wear all day, exciting but not overpowering. Got here very quickly, thank you! 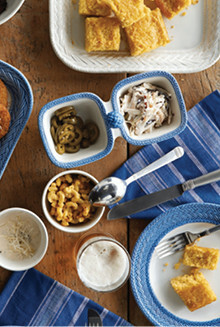 so cute, versatile (go with everything!) and look great from spring through to fall! I absolutely love these earrings. They are very light yet feel high quality. I usually do not spend more than $50 on statement trend earrings but when I saw these I knew I had to have them. They are light weight and can be dressed up or down. I bought the navy but may get the gold too! Will wear all year round. Received these the other day and got so many compliments when I wore them to work! Perfect, fun and great to pair with a casual shirt! Better than pictured! True navy color and not heavy at all. Nice they are posts and not wire also! Love these earrings! I've received tons of compliments on them. They add a lot of interest to a simple outfit while still being pretty neutral. They are also very light which I appreciate since so many statement earrings are too heavy to wear all day. These earrings are quite striking and I get a ton of compliments on them. The best part is that they are very light! These earrings are a wonderful sophisticated statement piece that will add glamour to any outfit. Great for the summer! These earrings do it all. The first time I wore them, I had so many compliments from sales people in different stores to friends to strangers. These earrings are winners. The size is great, the design right on trend. I really love the navy but plan on going back for another color. Take plain jeans and shirt to cute and stylish. I have worn them countless times. They can dress up an outfit or just be a sweet statement. Love them! Am I tempted to get them in the other colors? yes! LOVE these. I've worn these twice now: dressed up with a cocktail dress & daytime with white jeans. They're so versatile! I love them. They go with everything. These earrings are super cute and great quality. I have received several compliments. I would highly recommend. The Navy Dreamcatcher Earrings are PERFECT! Love them! They are lightweight, yet bold enough to make a big statement. Completely on trend, and still classic in navy, these earrings are a Spring and Summer must have! I love these Earrings! They are big and make a statement but light enough so I can wear them all day. I would love them in a bright summer color! Compliments all night! These earrings are really standout. I can't wait to wear these again! Love these! Cant wait to wear them soon, im sure i'll get tons of compliments! Grear price point! I want the burgundy too! I cant wait to wear these this spring! They are light weight and easy to wear and the solid navy color will look great with a lot of different options. Perfect for date nights! These earrings are a great statement piece. 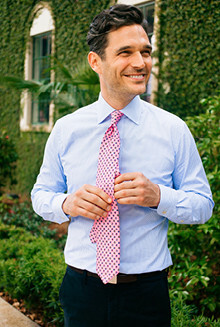 While very simple, they make a big impact to an outfit. Love these! I want them in every color! These are great statement earrings!! They are a little larger than I expected, but are perfect when you wear your hair back. They are difficult to see when your hair is down or not pulled back. So unique and perfect for several of my "looks". Bought these cute earrings to enjoy at the Dallas Cowboys playoff game and they worked perfectly! So cute, well made and not heavy at all!! So unique, lightweight, and great conversation starters! I wore these for the first time in Tulum and got a ton of compliments. I paired them with a few different things but they looked especially cute with the Eloise Off the Shoulder top! These earrings deliver on the Dream in their name. Tasteful and eye-catching. Trendy and sophisticated. Adore them....as do others when I wear them. These earrings are wonderful!!! You can wear them casual or dressy! A great purchase! I received the earrings in a timely manner and they were a great gift for my sister. She really enjoys wearing them. The best accent to any outfit! A must! I am super sensitive to earring weight and these were really lightweight and easy to wear! I purchased these earrings for a friend's birthday. Gorgeous and summery! I might have to buy myself a pair. I am a sucker for earrings! They are my go to. I was on the lookout for a textured pair and these are great. My only wish is that they were a bit more chunky. I love these earrings so much because they are large but lightweight, and can go with several outfits or even with a swimsuit. They are perfect summertime earrings! I’ve worn these a ton already this summer and like they are neutral and not too heavy. These were absolutely perfect for a beach wedding and I know I’ll wear them all summer long! Love these earrings!!! They go perfect with everything and give the perfect summer feel! My go to Summer Earring! These are my Go to Earrings. They go with everything, and are super light! Great earrings that are really light--even lighter than other dreamcatcher styles. Love them! I receive so many compliments every time I wear these! Great statement piece! I was hesitant to buy in september since summer is over but I'm so glad I got them anyway! They look amazing with sweaters, denim, etc. They dress up any outfit and will be great on vacation and next summer too! Very cute and better yet, extremely lightweight. They don't weigh my ears down at all! Cute Earrings! Pretty big, but exactly what I was expecting. 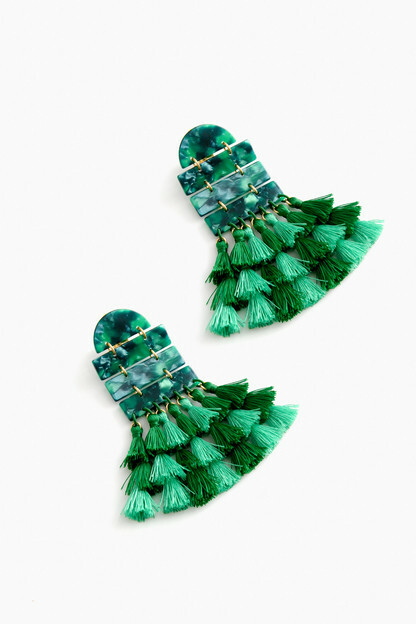 These are the perfect pair of earrings to up any outfit. They can be dressed up or down, making them fabulous! These are statement earrings for sure! Very large and kind of scratchy against your skin, but still stylish. Love these earrings and I get so many compliments every time I wear them. They're perfect! I Love these earrings! I have one in every color! They help spice up any outfit! Really beautiful and well made. They were just slightly too heavy for me. Definitely would have kept them if they were a tad lighter! Love that these are offered as clip-ons! They're a perfect way to dress up any outfit, from dress to a sweater. The white is really bright and will look great with spring outfits. I absolutely adore Tuckernuck's Dreamcatcher earrings! I own them in several colors and find myself wearing them all the time. They are lightweight (unlike some other larger statement earrings) and always attract a ton of compliments. Please bring these back in the Gold! These earrings are a true bright white. So perfect for summer. Even though they are larger they are very light weight. This is the third pair of earrings I have ordered from Tuckernuck. I’m sure it’s not the last! I absolutely love these earrings! I am a brunette so they stand out with my hair which was a selling point for me. I also enjoy the fact that they are a Tnuck exclusive so not everyone is wearing them! I have received multiple compliments and find them to be quite comfortable considering the size of them. 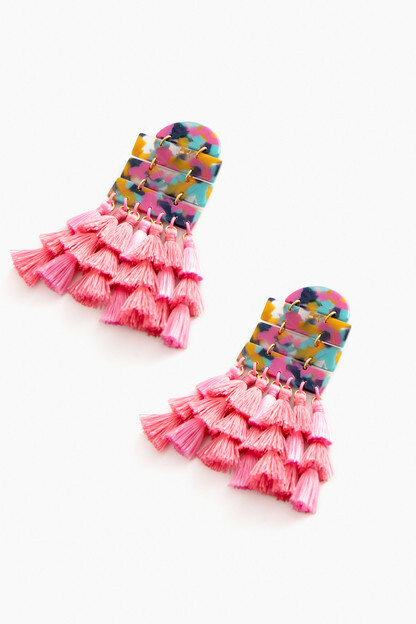 Bottom line...these are hands down my new Summer staple earrings! Can't wear these without getting a compliment! I love these earrings especially because they go with so many outfits and spice up even the most boring tops. For their size, they're super lightweight. Love love! Beautiful and well made - these earrings add a pop and looks great with all black during the fall! So much fun and surprisingly light!!! Perfect earrings for summer dressing. I LOVE these earrings. I got them in white so I can wear them with everything. I find myself wearing them all the time. I need to add another color. LOVE them! Ear-piercer part broke but got an IMMEDIATE replacement - THANK YOU TNUCK! Perfect size! Looks so cute with everything! Love these - perfect for summer! I've never been into big earrings so these were a little out of my comfort zone. However, when wearing them out last weekend I got tons of compliments so I went ahead and placed an order for another pair. They are awesome earrings and go with everything !! Love love love!! These earrings are even better in person. They are a perfect combination of trends this season. I use them all the time! These earrings are awesome!! I've gotten so many compliments wearing them. They go with so many different types of outfits and aren't very heavy! I can't say enough about these earrings! They are so adorable and go with everything! If you are considering buying these earrings, do it!!! You won't regret it. Gorgeous earrings! Not to heavy, match lots of outfits - will wear these for a long time! I purchased these beautiful earrings to go with a dress I purchased from Tuckernuck (also love my dress!). The earrings will be perfect with the dress and so many more outfits I have. They are a little heavier than I thought they would be, but I will still be enjoying them! Thanks Tuckernuck for having such beautiful things to choose from! I'm a fan!!!! I love these earrings! They are not too heavy and have been comfortable to wear all day. I get so many compliments! 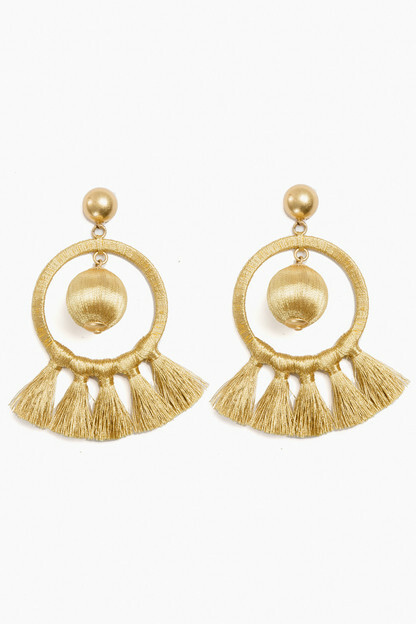 These earrings are chic -- will look great with a black turtleneck or white button-down for fall. Also, they are statement earrings that are not heavy/will not weigh down your ears. These earrings instantly dress up any outfit and are not heavy to wear. Can't go wrong here! Very beautiful and surprisingly light earrings. Can be worn with any casual or dress up outfit very versatile. Great quality! These earrings are fabulous! Larger in life than they look in the photos. They will dress up an otherwise casual outfit. Love them! Love these earrings - they are big but not very heavy, and the gold color goes with everything. Great staple! 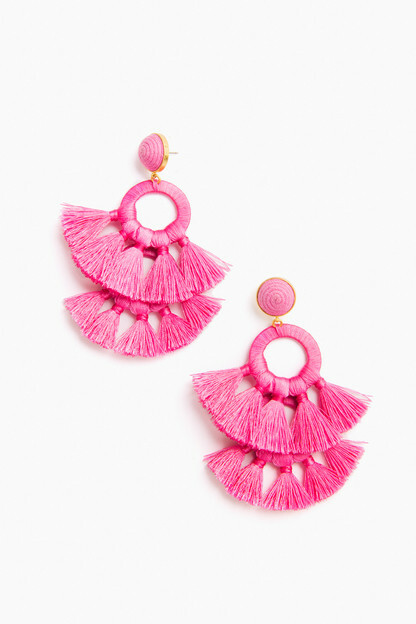 These earrings are the perfect size and the thread on the tassel is strong so it will not bend or look cheap. Gorgeous! I love these earrings! they are super cute! MY only issue is they are a little heavier than i prefer, i have sensitive ears so I probably won't be able to wear them for long periods of time. :( Other than that they are fab! Exactly what the site showed! They are so fun, and make such a great statement! Being a neutral gold they can dress up any outfit. Highly recommend for summer weddings and dressing up any outfit! Beautiful earrings and very light weight! These earrings are quite the statement earrings and can be dressed up or down. Coming from someone who doesn't wear earrings every day these are a bit on the heavy side. These earrings are even more gorgeous in real life. 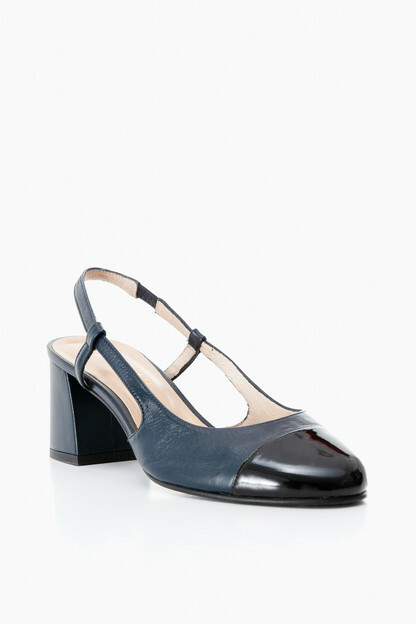 They are so easy to dress up and down and are such a statement on any outfit. Really excited about these--great gift.